Bee Pollen the product of young honeybees, is considered one of nature's most completely nourishing foods. It contains nearly all nutrients required by humans. Often blended in smoothies or sprinkled atop salads, I recently made a concentrated liquid version by dissolving the pellets in warm water. Note that water shouldn't be hot, e.g. don't put it in your tea - that'll kill the goodness. But slightly warm + lots of stirring = still raw pollen which you can drink straight or blend into breakfast. I'd never really tasted bee pollen before. It's delicious! Tastes like honey, minus the sugar. So fragrant and nearly sweet. Bee pollen is more rich in proteins than any animal source. 1. Energy: Carbohydrates, protein and B vitamins enhance stamina and fight fatigue. 2. Skin: Bee pollen is often used topically to treat inflammation and irritations like psoriasis or eczema. The amino acids and vitamins protect skin and aid the regeneration of cells. 3. Respiratory System: Bee pollen contains antioxidants that may have an anti-inflammatory effect on the tissues of the lungs. 4. Allergies: Bee pollen reduces histamine, thereby alleviating everything from asthma to allergies and a wide range of respiratory diseases. 5. 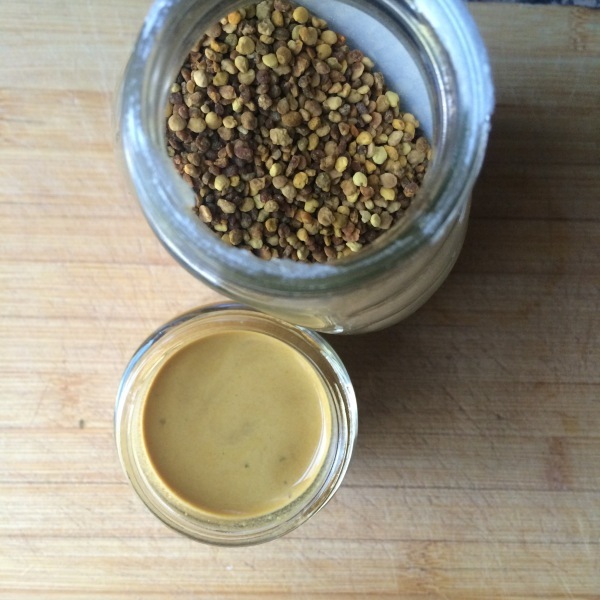 Digestion: In addition to vitamins, minerals and protein, bee pollen contains enzymes that aid in digestion. 7. Addictions: Inhibits cravings by suppressing impulses. 8. Cardiovascular System: Bee pollen contains large amounts of Rutin; an antioxidant bioflavonoid that helps strengthen capillaries, blood vessels, assists with circulatory problems and corrects cholesterol levels. 9. Prostate Aid: Bee pollen can help reduce inflammation to stop frequent urges to urinate. 10. Infertility: Bee pollen stimulates and restores ovarian function, so may be used to assist in accelerating pregnancy. As well as being a hormonal booster it is also a great aphrodisiac.